The programm can be found here. Miss Read: The Berlin Art Book Fair 2015 will bring together a wide selection of the most interesting artist/authors, artist periodicals and art publishers and will be accompanied by a series of lectures, discussions, book launches and workshops exploring the boundaries of contemporary publishing and the possibilities of the book. In conjunction, the third Conceptual Poetics Day will explore the imaginary border between visual art and literature. In 2015 Miss Read: The Berlin Art Book Fair will take place in cooperation with Akademie der Künste, Berlin, who will provide their main exhibition halls at Hanseatenweg. The Akademie der Künste is an exhibition and event location, a meeting place for artists and people interested in the arts, where public debates on art and cultural policy take place. Founded in 1696, the Berlin Akademie der Künste is one of the oldest cultural institutes in Europe. 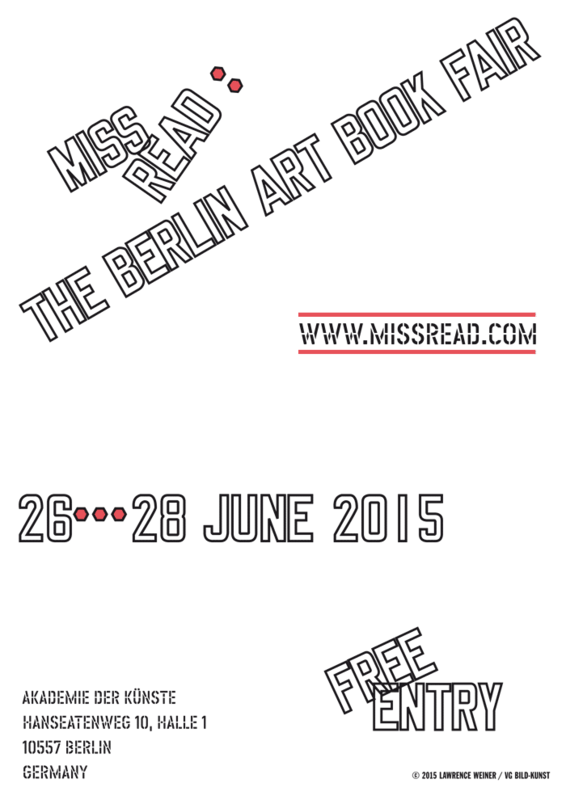 The poster and logo of Miss Read 2015 are created by Lawrence Weiner. Miss Read: The Berlin Art Book Fair 2015 is organized in collaboration with Akademie der Künste, Berlin. Volunteers 2015: Elisabetta Porcinai, Kristyna Comer & Martin Pheline. Miss Read: The Berlin Art Book Fair 2015 is supported by Literaturwerkstatt Berlin, Zitty, Riso Deutschland, L&Z, Geese Papier, 1210 Berlin, kaleri, Berlinarte, Monkey47, and we make it. Kommentare sind nicht möglich, allerdings sind trackbacks und Pingbacks möglich.